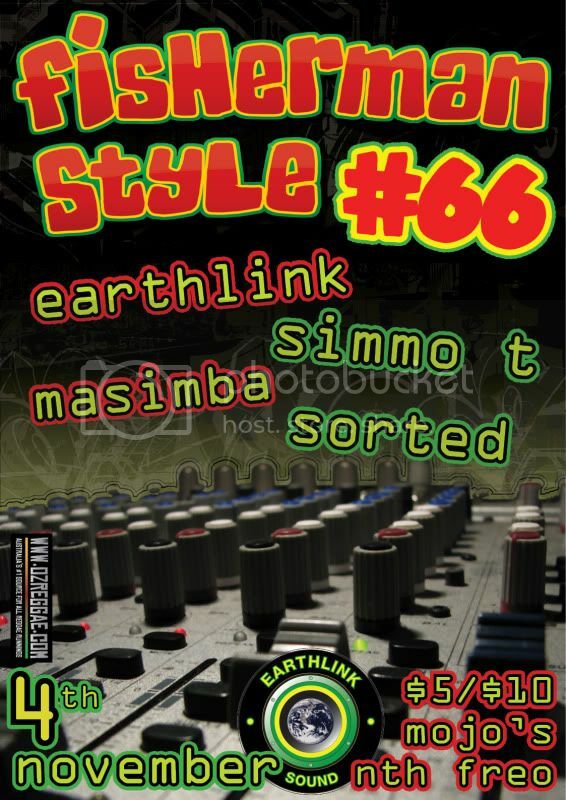 Friday 4th November sees the 66th instalment of Perth's longest running Reggae Night - Fisherman Style. After last month's packed Tribute to Gregory Isaacs this month we go up to di time with new tunes all night. This month EarthLink Sound plays alongside the roughneck Dancehall Don SimmoT, Fishy Style regular and Perth's no.1 Geeza - DJ Sorted. This month's special guest is young DJ on the move Masimba playing his eclectic mix of roots & culture & up to di time dancehall. With a vibe second to none, this is going to be a killer night filled with good times and much reggae dancehall niceness. Running from 8pm - 1am with Free entry before 9pm and then $10/$5 conc. Mojo's – your home of reggae music....................................to di world mi seh!!!! !